This month our search for machinery takes us to the north-east of the UK, to be more precise it’s to a now defunct chain of home improvement stores by the name of Dickens. By all accounts Dickens was a fantastic place to shop. They said that they had ‘…the biggest, the cheapest and the widest range of mowers in the world…’. They also had tillers, rotavators, lawn rakes etc and there’s a very short video clip at the bottom of this article – can you name any of the machines? It can sometimes be a mystery as to who sold which machine, take any vintage machine and if really lucky a search of the chassis or tin-work may perhaps result in finding a dealership sticker, generally it may be a local mower shop or an agricultural supplier. These details are helpful in determining where a machine originated from or at least the point where the transaction was logged. We are aware that there’s garden equipment and machines from the 1970’s and 80’s finding their way into collectors hands, yet these machines may not have originated from that trusty local lawn mower dealer or from an agricultural supplier, these 1970’s and 80’s machines may simply have been picked up from the local DIY store or catalogue company, think B&Q, Argos, Woolworths and even Green Shield Stamps. This takes us onto Dickens home improvement stores, they were like an independent B&Q and actually were eventually bought out by B&Q. 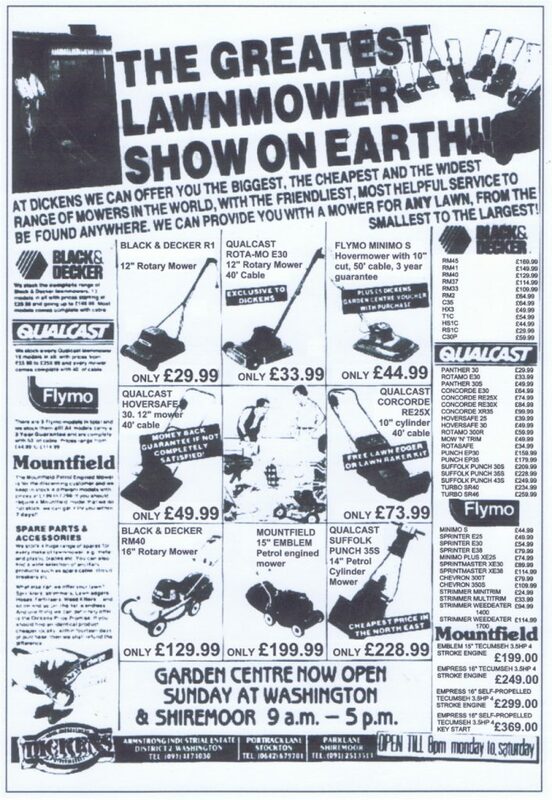 Dickens advert shown below from April 1988 at the start of the mowing season to attract the spending public shows a vast range of electric and petrol mowers and strimmers too. Who knew there were so many different models on sale at this time? A transcript of this model list and prices will be at the bottom of this article for perusal. Or click this link to see a larger image of the advert. Briefly, there is a huge range of electric mowers. What’s the difference between the Qualcast Concorde RE25X and the RE30X apart from £10.00 ? Or the Flymo Sprinter E25 and E30 ? A brochure would be mighty helpful! 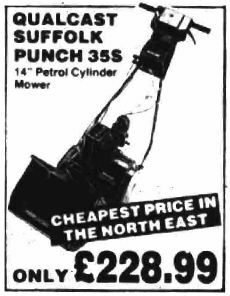 Of note is the advert showing there is a petrol Flymo Strimmer Weedeater 1400 and also a 1700 model – potentially a rare machine now as many may have expired through the last 30 years. The price then was £114.99 which is equivalent to some £308.00 today so a hefty investment for a homeowner. 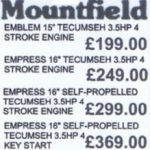 Mountfield have some mowers and all with the 3.5hp Tecumseh engine. Mountfield were mentioned in a previous article where some machines were made until 1982 in a factory in Luxembourg (article here) but where these would have been made is unknown. 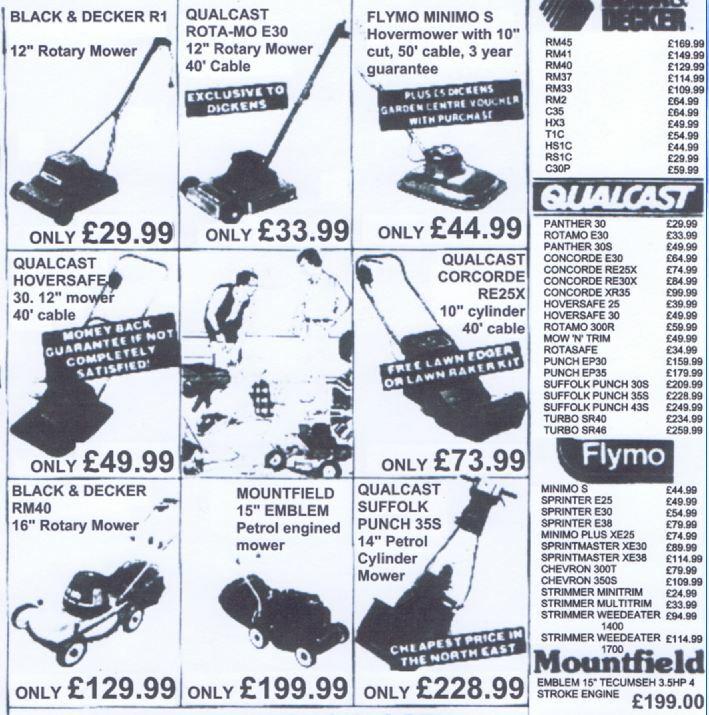 Business-wise there is a connection between Mountfield and Norlett of Belgium; then Qualcast bought Norlett, and further Qualcast/Flymo at the time had a production plant at Newton Aycliffe, County Durham not far from Dickens. It’s all very complicated and tenuous – but with Dickens saying they had ”…the biggest, the cheapest and the widest range of mowers in the world…’ it makes one wonder if they were mostly sourced from the nearest factories at a bargain price perhaps? There isn’t a Mountfield electric mower in the bottom right corner of Dickens advert, they may not have been manufacturing them at the time, but their petrol mowers show that the price nearly doubles between the Mountfield Emblem 15″ and the 16″ self propelled with electric start, both with a 3.5hp Tecumseh engine – would that be a premium product at the time? Can anyone name the machines being shown in the video below?